Jerome Wilson's short stories embody the finest of the Southern Gothic tradition. Each story depicts a slice of life, examining the normal family as a dysfunctional unit against the backdrop of societal norms. Like Shirley Jackson, Wilson skewers the traditional life America has seemingly outgrown through an exploration of family gatherings centered on birth, holidays, and death. Experience life with poignant characters ranging from oddball to deeply dysfunctional. Wilson's bemused, tragic eye looks without blanching at family life and its persistent hopes and dreams in the face of such obstacles as ignorance and poverty. Each character you meet has his or her own strength to not only survive to overcome and thrive. They all have something to say in their own way. Wilson's stories walk down the dusty dirt roads of a fading South taking you along and introducing you to the neighbors along the roadside. 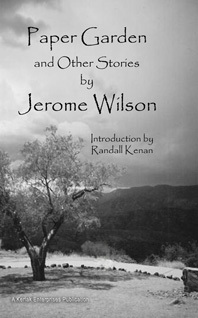 Jerome Wilson now adds his distinctive voice to the Southern literature's grand tradition of unique and powerful characters, observed through a lens of sharp humor.